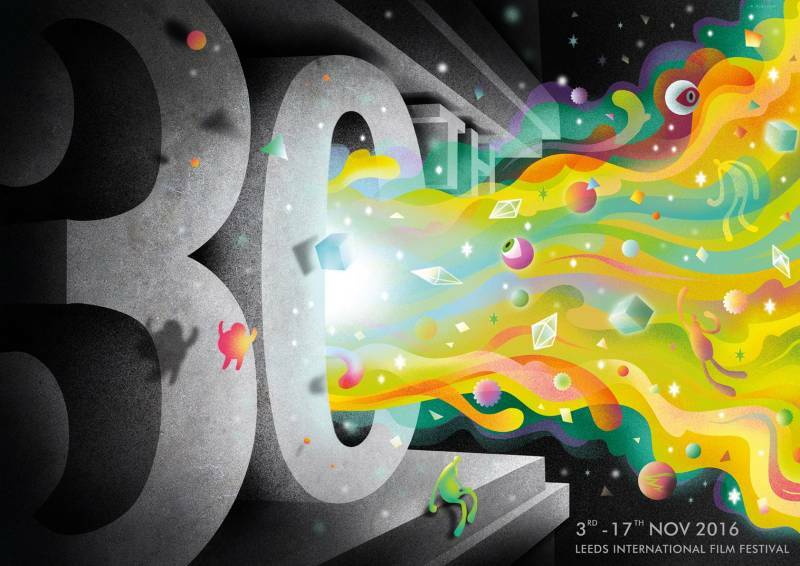 It is the 30th edition of the Leeds International Film Festival this November. From its instigation in 1987 by members of the Friends of Hyde Park Picture House the festival has consistently presented a wide-ranging programme of films and film based events annually, across a shifting landscape of city venues. Laura Ager, a volunteer at the Hyde Park Picture House who has worked with the film festival in various roles over the last 10 years, recalls how she first became interested in the history of the festival and, in the course of her research, has tracked down some of its former directors and supporters to ask them what the festival meant to them. Two typed documents, discovered by chance in the office of the Leeds International Film Festival at Leeds Town Hall, announced the coming of The Leeds International Film Festival. Leeds, the birthplace of the film industry, will celebrate the centenary of the moving image by holding a major international film festival. This film festival would celebrate 100 years since Louis le Prince filmed the people and traffic in ‘Leeds Bridge Scene’ at a spot now marked with a Leeds Civic Trust blue plaque. 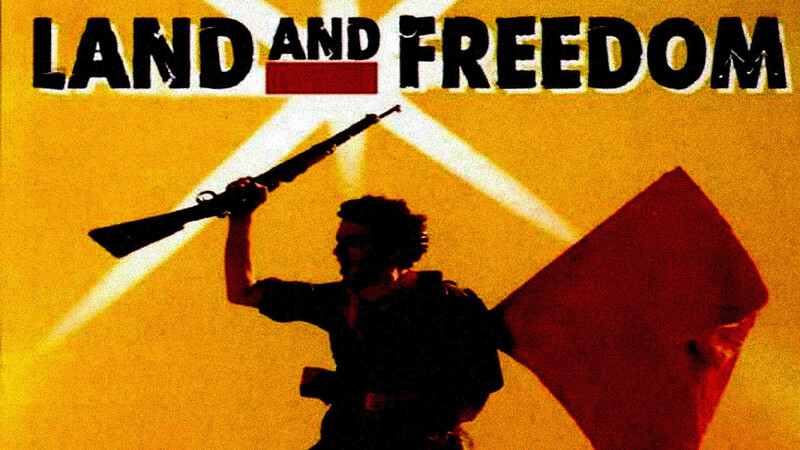 Land and Freedom / Tierra y Libertad UK, Spain, Germany, Italy 1995. Sunday July 10th at 3 p.m. This film was an earlier success for Ken Loach and his team. It won a number of European Awards including the FIPRESCI International Critics Prize and the Prize of the Ecumenical Jury at the 1995 Cannes Film Festival. It did not win any awards in the UK or USA. In fact, as has often been the case with films directed by Ken Loach, the film performed better on the Continent, especially in Spain and France, than in the two major English Language territories. There are ironies in the producing countries, since the Spanish, German and Italian regimes were all involved in the Civil War depicted in the film, whilst Britain [like the USA] stood on the side-lines, essentially supporting the force who are enemy in the film. The Civil War was that between the Fascist regime that staged a coup d’état against the elected Spanish government in 1936 and the coalition of left and liberal forces of the Spanish Republic defending the land and the freedom of the Spanish people. This was the great cause in the 1930s and many politically committed British men and women went to Spain to fight and often die in the defence of the Republic. 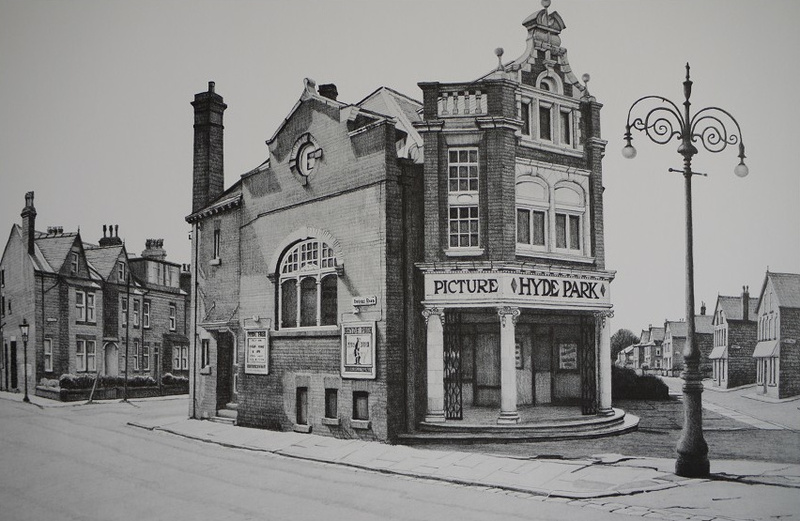 Hyde Park Picture House, 101 years old. 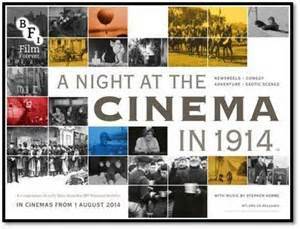 This Monday, 2nd November, exactly one hundred years ago, the Picture House opened for its second year of business. Already in the first twelve months of film entertainment it had successfully established itself. The log books, donated to the West Yorkshire Archive Service in 2015, record the box office takings. Weekly attendances were now regularly over 2,000. At a Bank Holiday they could exceed 3,000. And the same happened when there was a really popular film. So the log books record key titles, and Charlie Chaplin had already registered with his amazingly fast rise to fame and stardom. 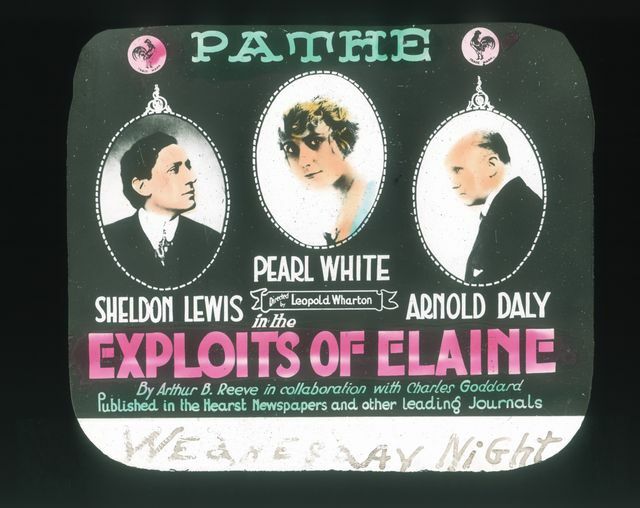 On the Thursday of that week another popular title opened at the cinema: The Exploits of Elaine (Pathé USA, 1915). The Exploits of Elaine was a serial, with fourteens separate episodes. The Hyde Park appears to have screened the separate episodes weekly, as part of the Thursday programme, as the box office increased towards the weekend. ‘The Cosiest Picture House in Leeds’. This illustration is from the printed history of the Hyde Park Picture House published by the Friends in 1997: [copies still available at the cinema]. Recently a relative of Harry Childs, who was involved in the opening and running of the Hyde Park Picture House, donated a set of ‘Log Books’ that start with the opening of the cinema and carry on until the 1950s. The books record the daily performances, ticket sales in different price categories and the daily and weekly income. You can imagine that there are lots of figures to be analyzed. 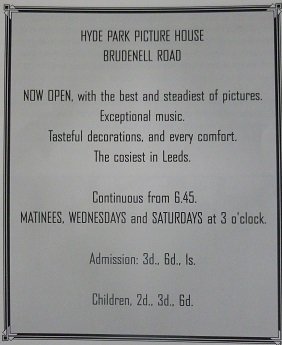 The performances and prices are shown in the above advertisement from the Yorkshire Evening News. It is not clear how seats and customers were demarcated, perhaps the 1s. seats were in the balcony. The bulk of the customers fell into the 3d and 6d price range. Firstly, the capacity of a standard rectangular theatre was increased by using a balcony .. [which] … allowed an astounding 587 people to be crammed in. [Since the 1980s the seating has been reduced to 350]. The records in 1914 offer no information about the films screened. However from early in 1915 the title of the feature is usually recorded in the margin. The norm appears to be two prrogrammes a week, one from Monday to Wednesday and one from Thursday to Saturday. This is done briefly, so it is not always possible to identify the film: and about two thirds of titles from this period have been lost. However there are also other sources.